In July, we were at the lowest point in Bolivia’s Madidi National Park — the Pampas de Heath. Since then the Identidad Madidi team has traversed upward to visit two types of cloud forest at Sarayoj and, in mid-November, the 14thstudy site Chullo near Keara. 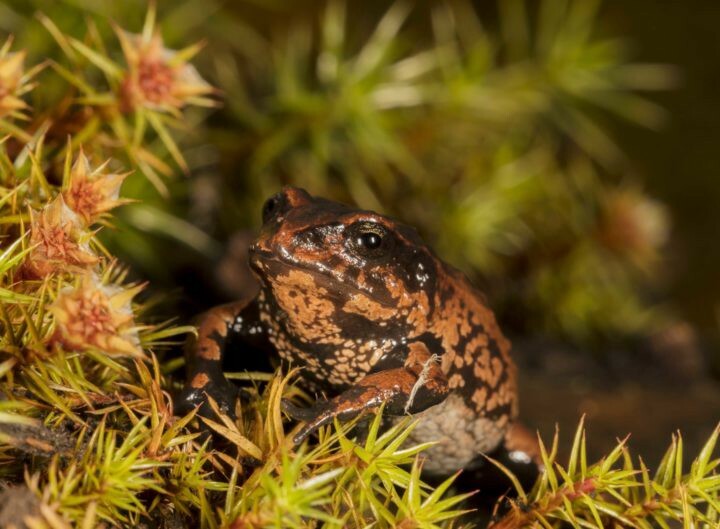 CHULLO REVEALED ANOTHER NEW SPECIES CANDIDATE OF THE MICROKAYLA ANDEAN FROG. PHOTO: ROB WALLACE/WCS. Chullo revealed more of Madidi´s secrets with another (sixth) candidate new species of the Microkayla Andean frogs, 16 new plant records for Madidi and the 1,024thconfirmed bird for the park, the swallow-tailed nightjar (Uropsalis segmentata). We have registered a Pleuroderma frog at 5,020 meters, the highest amphibian record for Bolivia, and another Liolaemus lizard, a new record for Madidi. Now, as the 30-month expedition draws to a close, I am writing this piece from my tent at 4,815 meters above sea level at the last of the 15 study sites. 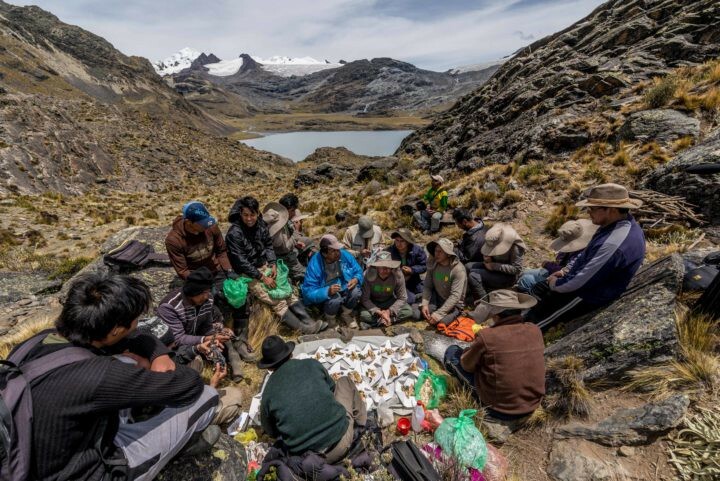 Finally, a team of biologists are sampling the highest portion of Madidi, and — crucially — the tiny piece that sits on the western side of the Andes in the Suches watershed that feeds Lake Titicaca. AT CHULLO, IN THE KEARA VALLEY, A VIEW UP THE CHACUMA VALLEY WHICH IS ONE OF THE BORDERS OF MADIDI NATIONAL PARK. PHOTO: ROB WALLACE/WCS. We knew that new records would not be bountiful here. After all, the number of species at this high altitude site is characteristically low, with just 52 plants and 35 birds registered in a week of intensive fieldwork. However, since nobody had previously sampled at these altitudes, almost all of the bird records are new altitudinal records in Bolivia. 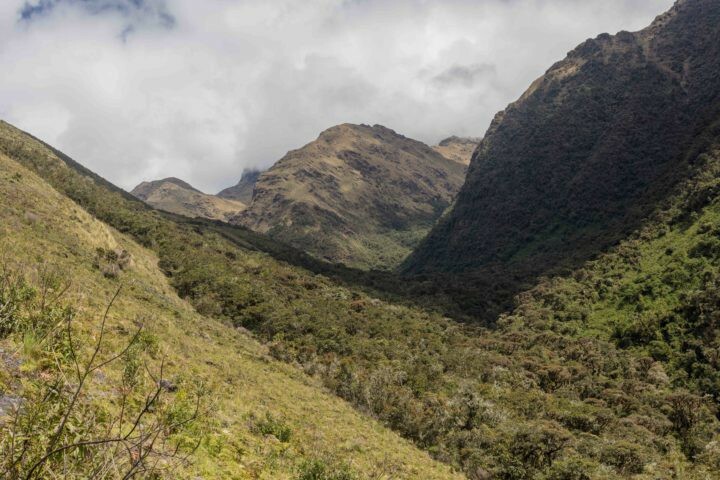 We have also registered a Pleuroderma frog at 5,020 meters, the highest amphibian record for Bolivia, and another Liolaemus lizard, a new record for Madidi and currently in the process of being described. At 5,120 meters, it is the second highest record for the highest living reptile on the continent. The extent to which our altitudinal records are a product of species climbing the mountain as ice diminishes due to global climate change, as opposed to our sampling of previously ignored habitats, is a debate that only long-term monitoring using the Identidad Madidi baseline will reveal, but there is no question that Andean glaciers are diminishing and snow-capped peaks melting. 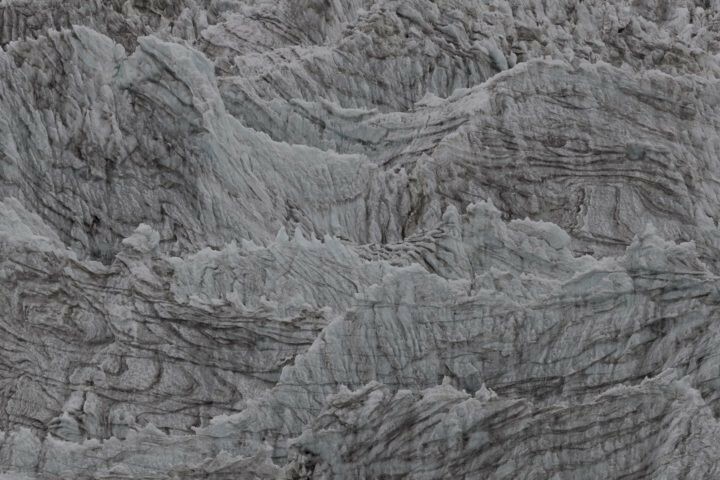 THE MESMERIZING PATTERNS AND COLORS OF THE CHOKOLLO GLACIAL FIELD. PHOTO: ROB WALLACE/WCS. The landscapes and scenery of Chokollo are breathtakingly stunning. Today, during a 17 km high altitude hike we visited a truly wonderful place that I have been looking at on the map for more than 15 years — the base of the glacial flow from the 6,044 meter Chaupi Orco peak in the Apolobamba range. The colors, textures, patterns and shapes of the ice instill a sense of wonder mixed with a frenzied desperation to try and capture quality images. But as we leave this truly awesome place, our elation is tinged with melancholy as we recognize the extent to which this glacial field has recently diminished. ROCK EARTHCREEPER (OCHETORHYNCHUS ANDAECOLA). PHOTO: ROB WALLACE/WCS. And, of course, there were new species records for the park here too. Four wonderful birds — the rock earthcreeper (Ochetorhynchus andaecola), the puna miner (Geositta punensis), the puna snipe (Gallinago andina), and the diademed sandpiper-plover (Phegornis mitchellii) boosted the official Madidi list to an astounding and record-breaking 1,028 confirmed bird species. There were new plant records and even butterflies, too, at this altitude. Indeed, we believe that the two Histiotus big-eared bat species registered at 4,850 meters above sea level may represent the highest altitude bat records in the world. On the last day before we left Chokollo and closed out field work for Identidad Madidi, we arranged a local Kallawaya medicine man to perform a spiritual ceremony to give thanks to the Pachamama, or Mother Earth, for looking after everyone on the expedition. A hugely symbolic new official record was the confirmed presence of a resident population of vicuña (Vicugna vicugna). Following the creation of Madidi´s neighboring protected area, Apolobamba, the population of vicuña bounced back from around 100 in the mid-1960´s to more than 13,000 today, and this recovering population has now spread into Madidi. THE KALLAWAYA CEREMONY TOOK PLACE LOOKING OVER THE CHOKOLLO LAKE AND THE CHAUPI ORCO MOUNTAIN. PHOTO: OMAR TORRICO/WCS. Encouragingly, the wildlife symbol of the High Andes, the Andean condor (Vultur gryphus) was frequently observed by members of the team at both the Chullo and Chokollo study sites. 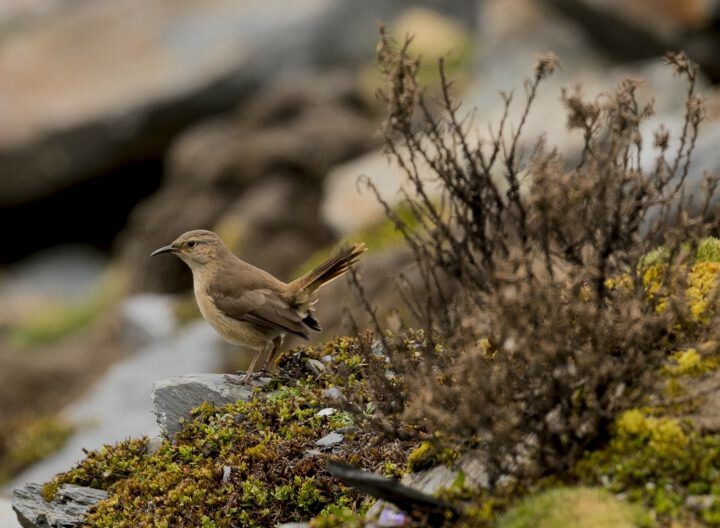 Threatened across much of its range, the Apolobamba mountains are a regional stronghold for this magnificent bird, which has huge cultural significance for Andean peoples. For the Aymara indigenous people, indigenous leaders are known as mallkus. The mallku is the spirit of the mountains, and the condor is the physical manifestation of this spirit. 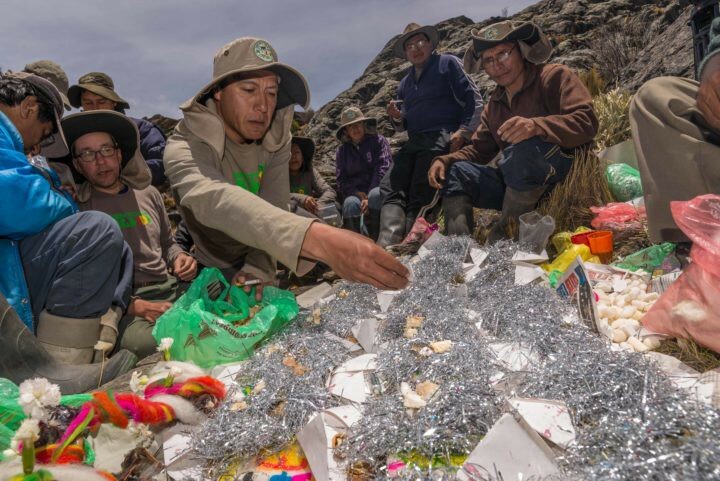 ONE BY ONE THE MEMBERS OF THE TEAM PLACE A VARIETY OF ANDEAN SYMBOLS AS OFFERINGS TO THE PACHAMAMA. PHOTO: OMAR TORRICO/WCS. As a Bolivian team, on the last day before we left Chokollo and closed out field work for Identidad Madidi, we arranged a local Kallawaya medicine man to perform a spiritual ceremony to give thanks to the Pachamama, or Mother Earth, for looking after everyone on the expedition, and especially for revealing so many of Madidi´s secrets. The 3-hour process allowed us to collectively recall each of the amazing places we had visited, the people who had helped us in all sorts of ways, the incredible species we had encountered, and of course the trials and tribulations of a major adventure. And then, as the ceremony drew to close an adult condor glided over the group and we all felt truly blessed. You can read about the expedition in more detail on our webpage, or on Facebook, where updates are most frequent. Dr. Rob Wallace is a Bolivia-based senior conservation scientist in the Latin America and Caribbean Program at WCS (Wildlife Conservation Society). Originally published at blog.nationalgeographic.org on January 29, 2018. Madidi National Park is one of the most important protected areas of Bolivia and the world because of the extraordinary biological richness expressed in the diversity of its ecosystems, fauna, and flora.